I cheated a little on this picture. It was actually taken yesterday while shopping. Pokey was having a fit in the middle of Wal-Mart. I meant to get a picture today, but my body had other plans. I'm not sure if I got food poisoning or a stomach bug, but I was up puking last night and still not feeling well today. Hopefully tomorrow will be better. i say it still counts! Hope you feel much better very soon! 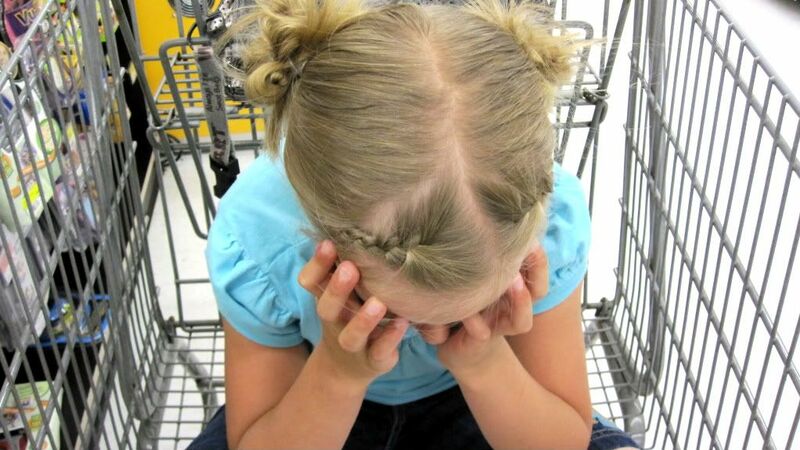 One time my kids were HORRIBLE in Wal-Mart and at was while I was buying the food for their Christmas dinner and some presents as well (not theirs to receive). Anyway... I told them to knock it off our we would be leaving it there and probably not have any food for Christmas. Well, they didn't. So I left the basket as it was and we let the store. The whole time they were screaming... we need our food. We need our food! We're going to starve. Perhaps people would think I'm a terrible parent, but they've since learned their lesson! Hopefully your little one will get the hang of shopping once again. At least she has cute hair :) LOL! I hate when that happens, it's no fun!